I’m very ready for this week to end. Excuse me while I whine about work for a minute because everyone is sick with some sort of flu again. Three people in our group were out either sick or caring for a sick kid and I spent the day juggling 14 things at once with constant interruptions, ugh! 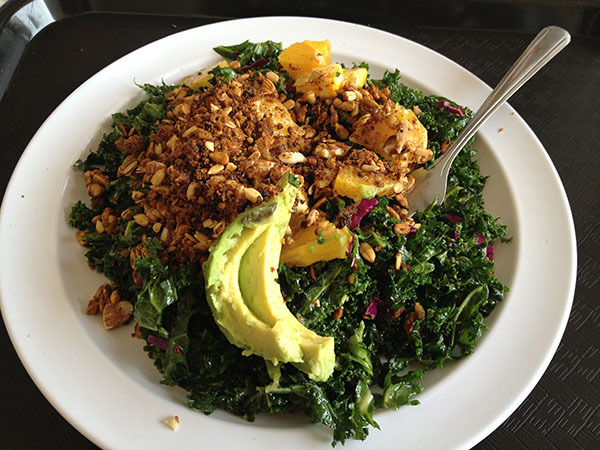 Somehow I was able to breakaway for lunch and met hubby at Baagan for a huge kale salad with oranges, avocado, and a spicy crunchy sunflower seed topping. I could eat this salad every day and not get tired of it! 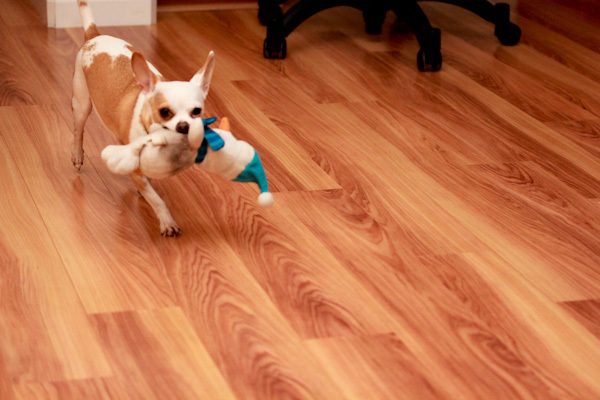 Leela seems as cranky as me today snarling at Miko as he tore around with his toy. While Miko is never cranky, life is just one big party. I was drawing blanks on what to do for dinner, just knew that I was craving quinoa and had broccoli in the fridge that needed to be used up. 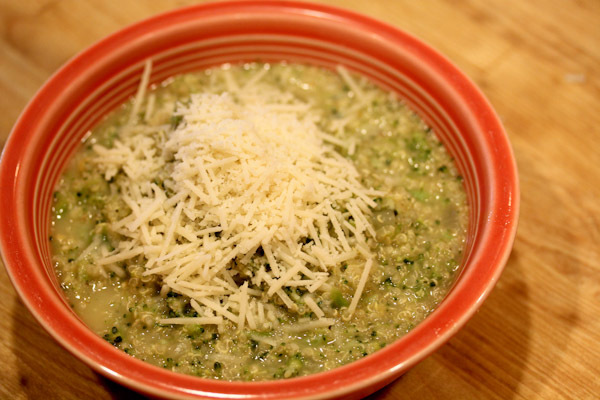 This Easy Quinoa Broccoli Soup recipe caught my eye even though it’s not exactly vegan friendly. A little tweaking and I came up with a good, lighter vegan version. 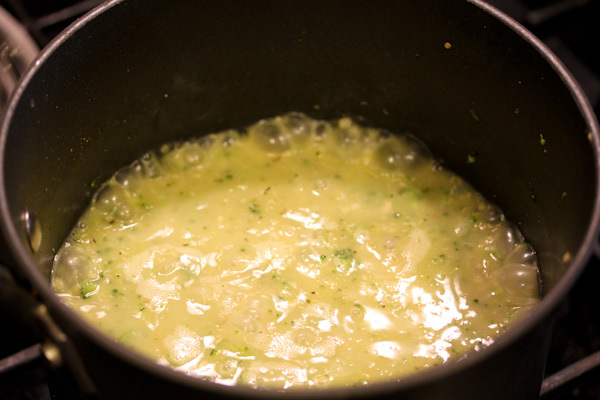 Saute oil, onions, and garlic in a medium soup pot over medium heat until onions are translucent. 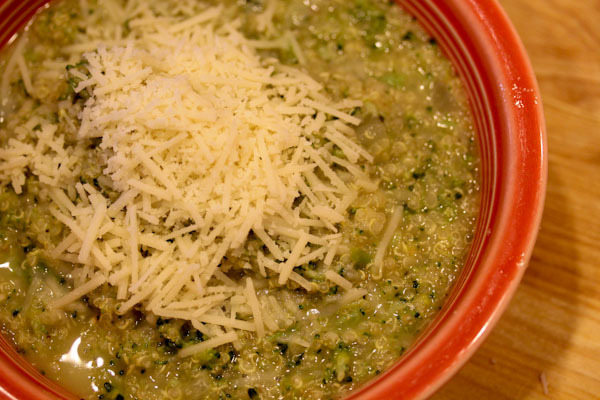 Stir in water, quinoa, broccoli, miso paste, and seasoning blend and simmer over low heat for 15 minutes. Add hummus and nutritional yeast and stir over medium-high heat for about 5 minutes or until soup thickens. Makes 4-6 servings. 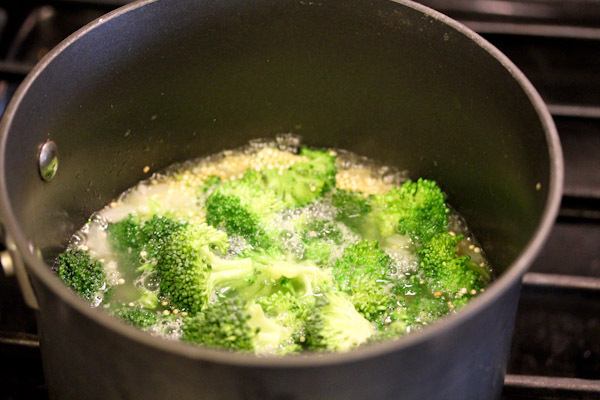 You can throw larger broccoli chunks into the pot because they break up nicely to blend with the quinoa after simmering. 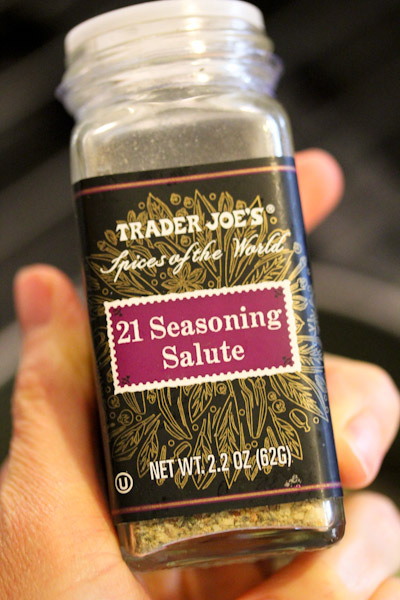 And you can use a seasoning blend of choice, I grabbed Trader Joe’s 21 Seasoning Salute. Same goes for the hummus, you can use plain or get crazy with a flavored hummus. 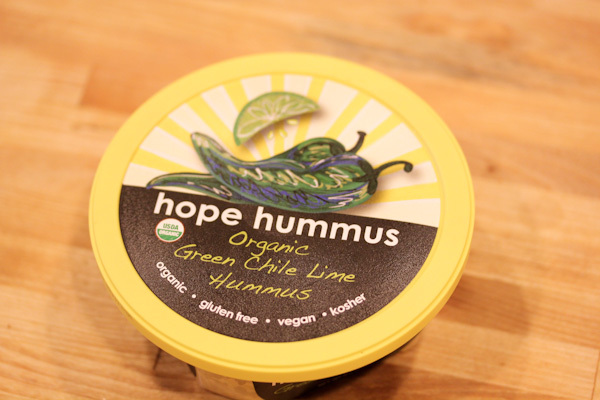 I used Hope Hummus. And topped it with Trader Joe’s Vegan Mozzarella Shreds for a simple dinner. 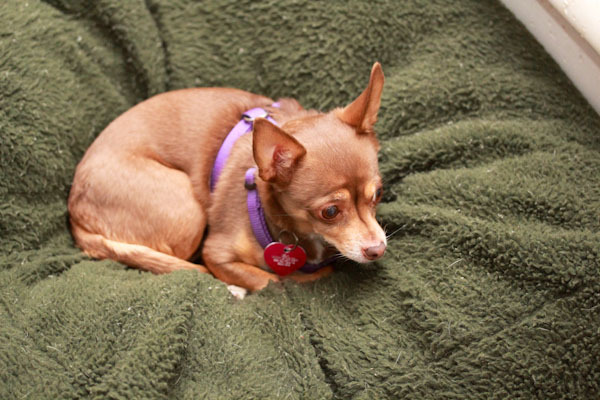 LOVE your chi’s!!! So cute! Leela looks scared! But CUTE! Mike – how fun! I need to find some more toys for ours that they won’t bust in seconds! That Kale Salad looks amazing!!! WOW! That soup sounds AMAZING and I MUST try it SOON!!! OMG! I have a giveaway for raw vegan chocolate on my blog today!!!! Thanks on the chi’s, they’re so much fun. 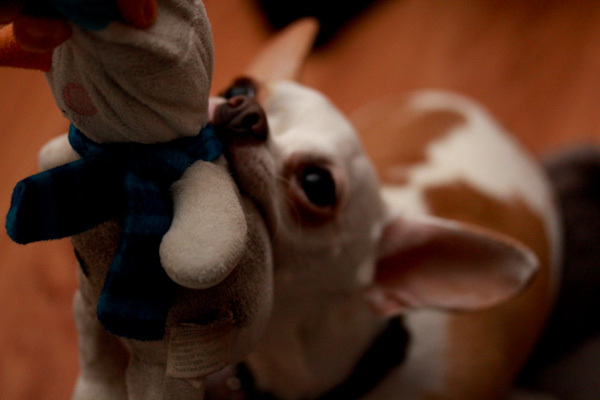 Miko is very tough on toys too, he ripped the stuffing out of one this weekend. Just following up! My dear friend just had oral surgery, so eating anything requiring chewing was out of the question last night. OTOH she has a healthy appetite (in both senses of the word) so I decided this was a good opportunity to try this, since it looks both healthy and filling. Happily I have all the ingredients as part of my pantry of ‘usual suspects’ so 1/2 hour after she asked ‘what’s for supper’ I presented her with a bowl of this creamy goodness. It was a huge hit! I used 21 spice hummus and Bragg’s Sprinkle, and chickpea miso, I never even remembered the Daiya shreds it smelled so good on its own. I strongly suspect this is going to be made again within the week, as she practically begged for the leftovers ;-) Thank you!